The inside of the kettle is spotless with no stains. Condition is Used. With a cockerel on one side. a two pint I believe and is clean and looks like used once or so as like new. 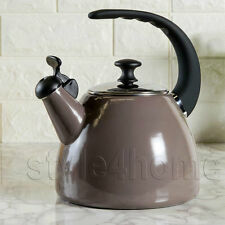 Vintage Stove Top Kettle Metal Enamel Coated Judge Ware Brown Large Rustic H11"
In lovely condition with age related marks but nothing too terrible. The inside looks a bit rusty, but there don't appear to be any leaks. I am moving house and having a clear out, hence the reason for sale! Date: circa 1970’s. Colour: Cream, Blue & Red. 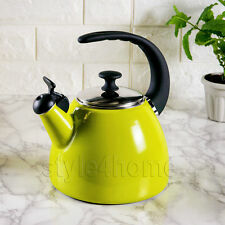 Creen Enamel Kettle. Condition is Used. Dispatched with Royal Mail 2nd Class. 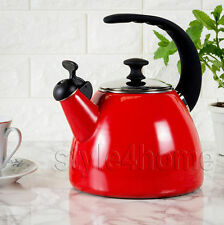 Great vintage kettle. Heavy item. Damage as shown in photos. Please look carefully at the photos before purchasing these form the main part of the description. Happy to combine postage within the UK on request. Thank you. Please note that I am unable to post between 18th of April and the 30th of April. Apologies for the inconvenience.